A quartz crystal consists of silicon dioxide. 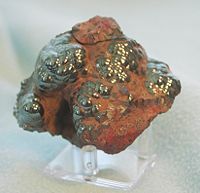 This hematite specimen (kidney ore) consists of iron(III) oxide. 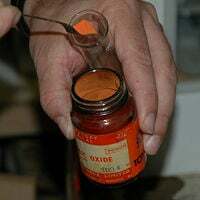 Mercury(II) oxide (mercuric oxide) has a reddish orange color. An oxide is a chemical compound consisting of molecules in which at least one oxygen atom is bonded to other elements. Most of the Earth's crust consists of oxides. Many oxides are produced when elements react with oxygen in the air. Several materials that are considered "pure elements" have an oxide coating. For example, aluminum foil has a thin skin of aluminum oxide (alumina, Al2O3) that protects the foil from further corrosion. The two principal oxides of carbon, carbon monoxide and carbon dioxide, are produced by the combustion of hydrocarbons. Water (H2O) may be considered an oxide of hydrogen. In the eighteenth century, oxides were named calxes or calces, after the calcination process used to produce oxides. Calx was later replaced by oxyd. The name of an oxide is often based on the number of oxygen atoms in each molecule of the oxide. For example, an oxide containing only one oxygen atom per molecule is called an oxide or monoxide; an oxide containing two oxygen atoms per molecule is a dioxide; three oxygen atoms, trioxide; four oxygen atoms, tetroxide; and so on, following the Greek numerical prefixes. superoxide, with the formula O2−. In such species, oxygen is assigned oxidation states higher than that of oxide (which is 2-). Oxides of more electropositive elements (particularly metals) tend to be basic, and they are called basic anhydrides. Upon adding water, they may form basic hydroxides. For example, sodium oxide is basic; when hydrated, it forms sodium hydroxide. Conversely, oxides of more electronegative elements tend to be acidic. They are called acid anhydrides. Upon adding water, they form oxoacids. For example, dichlorine heptoxide is an acidic oxide; perchloric acid is a hydrated form. In some cases, an oxide can behave as an acid or a base, under different conditions. They are called amphoteric oxides. An example is aluminum oxide. Other oxides do not behave as either acid or base. The oxides of chemical elements in their highest oxidation state are predictable and their chemical formulas can be derived from the number of valence electrons in the atoms of those elements. One exception is copper, for which the highest oxidation state oxide is copper(II) oxide and not copper(I) oxide. Another exception is fluoride that does not exist as expected as F2O7 but as OF2, with the least electronegative element given priority.. Phosphorus pentoxide, the third exception, is properly represented by the chemical formula P4O10, not P2O5. Concentrations of oxide ions in water are too low to be detectable with current technology. Authentic soluble oxides do exist, but they release oxyanions, not O2-. 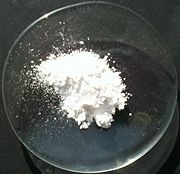 Well-known soluble salts of oxyanions include sodium sulfate (Na2SO4), potassium permanganate (KMnO4), and sodium nitrate (NaNO3). ↑ Emeric Schultz, "Fully Exploiting the Potential of the Periodic Table through Pattern Recognition," J. Chem. Ed. 82(2005): 1649. Chang, Raymond. 2006. Chemistry, 9th ed. New York: McGraw-Hill Science/Engineering/Math. ISBN 0073221031 and ISBN 978-0073221038. McMurry, J., and R.C. Fay. 2004. Chemistry, 4th ed. Upper Saddle River, NJ: Prentice Hall. ISBN 0131402080. This page was last modified on 2 April 2008, at 13:41.